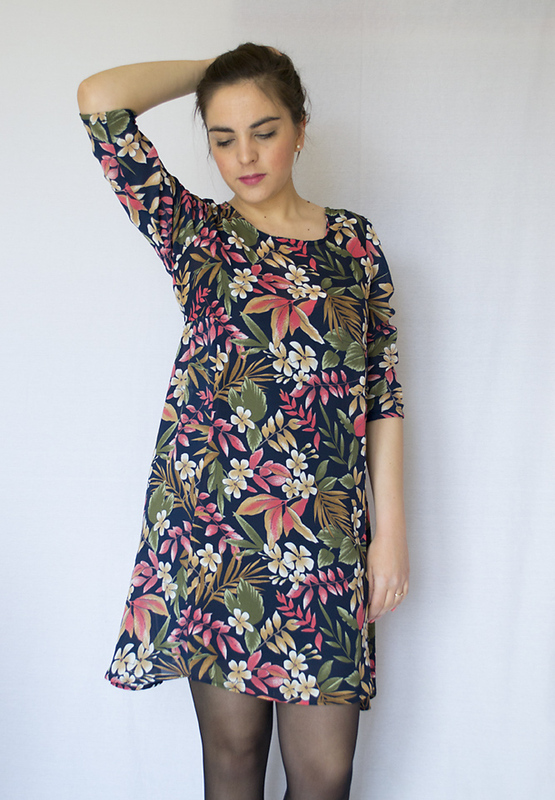 The Nancy dress sewing pattern from Sew Over It is a loose fitting swing dress. It is made up of unique panels which provide shaping at the bust and back of the dress. Extra shaping at the back with darts gives the dress a lovely gentle fit. There are 3/4 length sleeves, and a bias-bound neckline with the option of two different neckline shapes: a high neck or a slight scoop. There are no zips or buttons – the dress is pulled on and off over your head, closing with a hook and eye. What we think: This is a really versatile pattern and would look great as a dress but also as a tunic over a pair of jeans. The simple construction makes it perfect for a confident beginner looking to up their skills. Suggested Fabrics: A lightweight woven with some drape like a rayon or crepe. 4 out of 5	Comfortable, elegant and swishy! This is a great pattern for advanced beginners as you use skills such as bias binding a neckline, joining ‘Y’ seams and working with pieces cut on the bias. I used a beautiful drapey crepe for my Nancy dress. It held a press well, which made it manageable to sew, but it gives the finished garment wonderful movement. 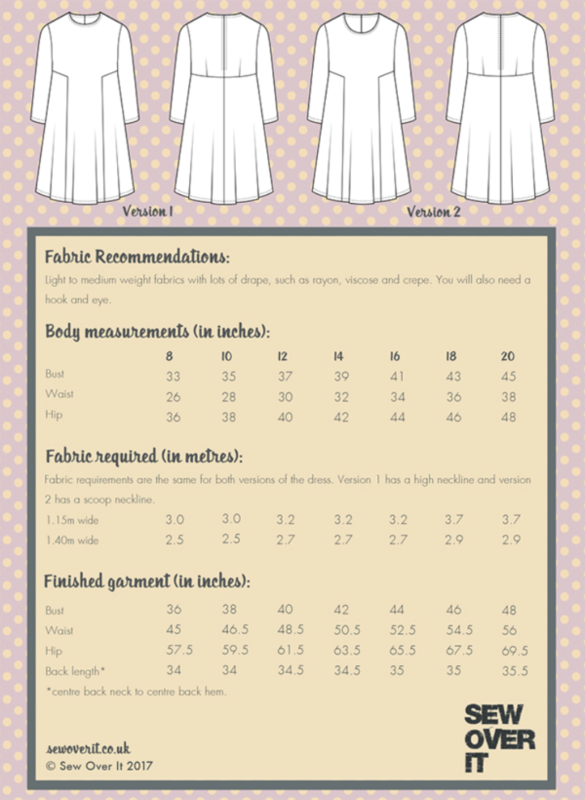 As you come to expect from Sew Over It patterns, the quality of instructions are excellent. Each step is very well explained and has an accompanying colour photograph, which makes even new processes or fiddly techniques achievable. The finished garment is exactly how I imagined it – comfortable to wear, but smart and elegant with a wonderful swishy skirt. It’s a very flattering style and it’s fun to wear! The front panel came out too tight: for some reason the part above my bust didn’t fit. So I unpicked it, resized the pattern, cut a new version and put it back together. I also made a pair of new sleeves because my elbows didn’t quite fit. Then, I thought I’d chop off a part of the backside, because for some reason the back panel was 8 cm longer than the front. But I didn’t realize it was rounded… So I chopped off too much and had to recreate the backpanel too. Fortunately I had enough fabric to do so! I also added pockets between the front and side panels. It’s kind of like a kangaroo-pocket on a hoodie, but this position seemed better to me than the side seam, which is more towards the back. I wonder if I didn’t somehow cut the wrong sizes of the pattern… It all seemed so weird. But I really like the result. A full review (in Dutch) and more images can be found on my blog: https://www.karinkay.nl/nancy-swingdress. 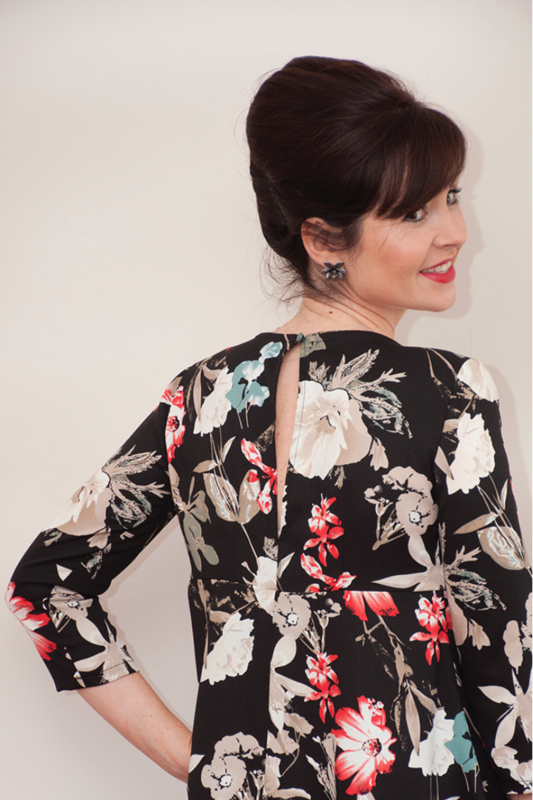 I love my Nancy dress! I style and fit is great for me and I will definitely be making many more of them. My only issue was that considering it’s a beginner’s project, the instruction were lacking the detail that I believe a beginner needs, especially for the type of fabric needed for this project. 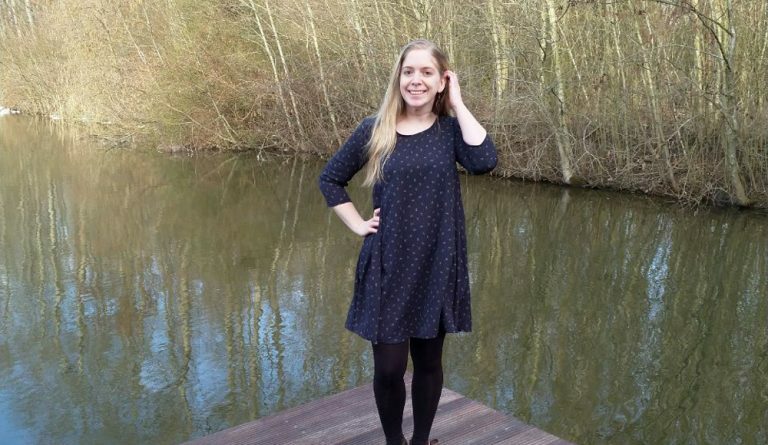 This was the first of two Nancy dresses I made. I love how swishy it is, and it was perfect for the “House Around” at our ceili dance! – The hem is a little shorter than usual. I liked it, but I was a little surprised as to HOW short, as I often wear my garments to the knee. Again, with tights and boots in winter I think it’s perfect – but it’s important to consider before you make it. – Hang it for a couple days (as the pattern suggests) before hemming, especially if you line your Nancy. I’m glad I did this with Caroline’s dress, as the lining stretched out more than the front fabric. Things got a little “creative” when I was hemming. – I added three hooks and eyes to the dress instead of 1. I found it would start to gape at the back, and I didn’t like this, so just having 1 wasn’t what I preferred. Caroline however liked this look, and only used 1. – Don’t be discouraged if your panel doesn’t line up juuust right your first time trying to sew it. 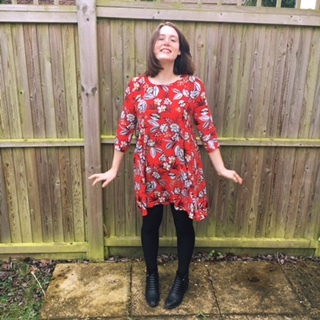 Having made this dress twice, including a lined version, I had a 50% success rate. A little time with your unpicker and fiddling and you’ll get it just right. 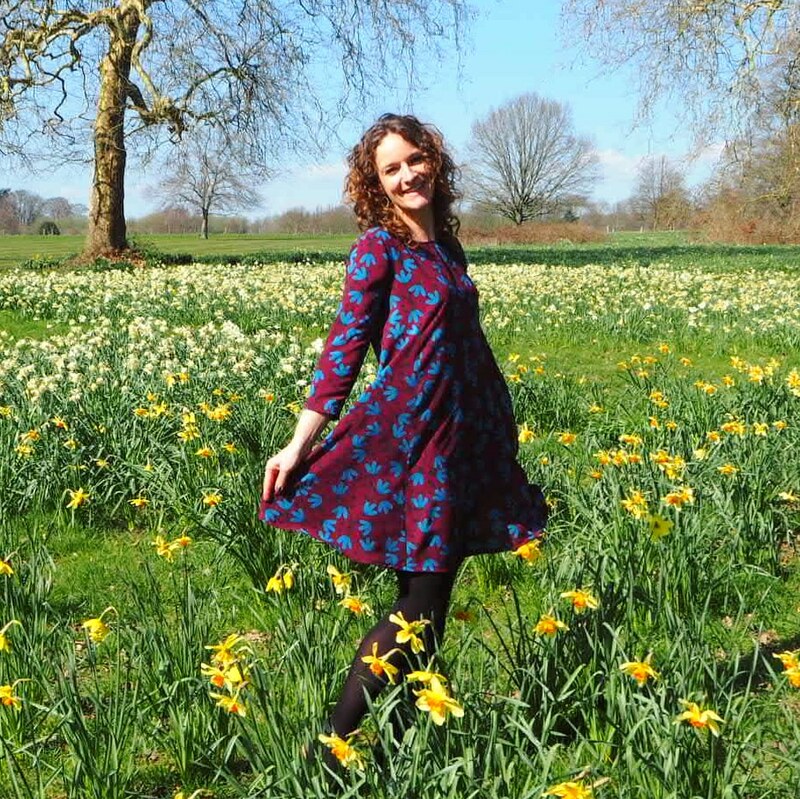 I had quite an adventure with my first Nancy dress, which is the floral one you see in the photos. It was my first time working with such a delicate and slippery fabric and cutting out the pieces was a nightmare! One thing I should mention to anyone who is wiling to give it a try is that please make sure you mark the side panels before you attach them on the front part. There is a reason why the instructions tell you to do that. I was in a hurry and very impatient to finish it -typical me- and I ended up attaching them the wrong way. So the dress hem was pointy on both sides and I couldn’t figure out why. I had so much trouble making it even and I didn’t realize my mistake until I made my second Nancy, the polka dot one. Other than that it’s a lovely and fairly simple pattern. Use your bust measurements to pick a size and you should have no fitting issues. Both my Nancy dresses are worn a lot and I adore them!